Happy Fourth of July to all; I have several salads in the fridge (three bean salad, kidney bean salad, olive and pasta salad, deviled eggs) along with watermelon, ears of corn, and makings for burgers. Hope you have lots of picnic goodies ready, too. Here is a lovely Civil War display at Deb's Cats 'n Quilts in Franklin TN. My friend Kathy N. took me for a drive out of town, which I can tell you I totally appreciated, although I was unknowingly coming down with flu at the time, which was followed by bronchitis, all of which overlaid the most recent chemotherapy treatment, I mean for heaven's sakes. This most recent chemotherapy session went much better. I am wondering and hoping if the next one might be the last one. No way to know, the doctor is playing it by ear, seeing how long the chemotherapy will continue to kill. Rembrandt the Unreal continues to shove around and pull fabric stacks out to make a nice sleeping alcove for herself. Back to charm school. Or reform school. I was going to wait to show this until I got it quilted, but oh well, here it is now. Recognize it? I got permission from Kathie of Inspired by Antique Quilts to show my version of the quilt she borrowed from her friend Lorre, posted about on June 22nd. Had to drop everything and make this one. Last and definitely least, here is my first attempt to make an Izannah Walker doll. Lord. Well, I drafted her body pattern, which is fairly good (legs need to be chunkier, noted on pattern for next try), her applied thumbs are very good, and her "second skin", typical of the Izannah dolls, is fairly good (needs some revisions, noted for next try), but the modeling of the head (paperclay over a fabric-stuffed head) is awful and the painting job is marionette-ish. At least she no longer looks like Winston Churchill as she did at the beginning. At one point, she also looked like a boulder in a stream. I suppose I shall make the silly thing a dress, but I'm looking forward to making a second doll at some point. I didn't even get to the stockinette look that is typical of an Izannah, or the aged look. I'm not sure right now where I got the two photos of Izannah's sweet face, so let me mention that Dixie Redmond has an enormous amount of information on Izannah on various websites, just google if you would like to drop off into Izannah Research Land, as I did these past few weeks. I wish I could see an original one in person, but I believe the closest one is in Ohio. Have a good day, everybody. I think the doll is coming along nicely. Yes, it will take some revisions, but knowing you you'll figure it all out and get it right. I'm going to Kroger for something to throw on the grill. I haven't been to the parade in years...it's just too hot! Love your doll! 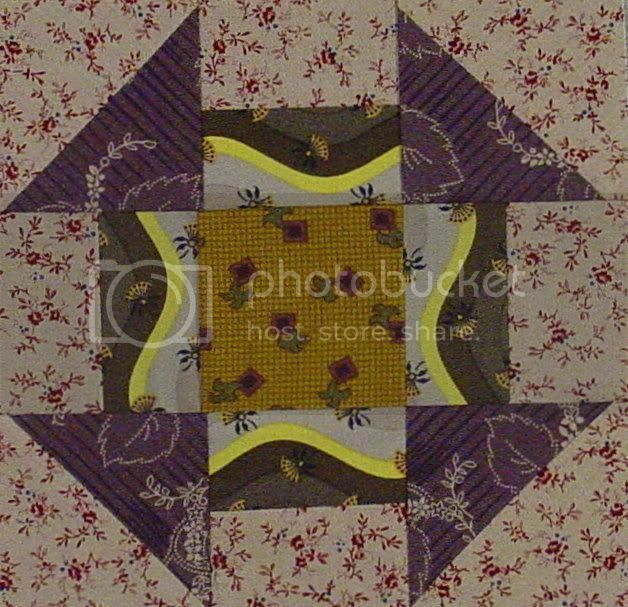 And your quilt with the yellow setting squares, it is wonderful. Dear hubby wants to go out to eat, but I insist on at least a watermelon and salads for later! Happy Fourth! I try to go to Deb's Cats and Quilts every year when we go to the mountains. A nice shop. I think that is the same sample quilt that was there two years ago. Nice shop. I was disappointed that I could not go last year because of my eye problem. I hope your chemo treatments end soon. It seems like such a long time ago that you started. But yet you continue to sew. Dedication. I remember the quilt from Kathy's blog. You whipped yours out quickly. So sorry you got so sick--it takes so much work to back to "feeling normal" when you get that bad. I will pray for your chemo--that things go well & it keeps killing the bad crap. Your kitty looks like he is having so much fun--what is it about a nicely stacked pile of fabrics that they love so much???? He has a darling face. I lost my kitty this spring. It is nice to see other people's kitties so I remember how great a cat he really was for me. Your quilt is great--very vivid colors--love the yellow. Lots of motion in the design. I love your doll. It is amazing how critical we are of our own work--she has a humble face. Her lips are great--nice delicate nose. If you don't start somewhere--how do you get better?? You are further along than I am. Have a great 4th of July week!! Wow! Your doll is amazing! I love it! Love the little gold quilt of course, and the shop display is really neat. Rembrandt, always adorable, no reform necessary. This is like one of those games where you try to remember all the things in the basket. What am I missing? Glad you were able to get out of the house and have some fun. Keep fighting it Karen! Hugs and hugs! Oh! Your first quilt with the houses! I love it!!! LOVE it! what a fun post. I love your yellow star quilt! fun to study the blocks. Your doll is looking really great - how fun! I covet your fabric stash. there I said it- I am a sinner. I follow Kathie's blog too but don't have time to make the quilts - even though they are samll. I love that shop in Franklin! Also love little sweet town of Franklin. Great chrome yellow & poison green in your quilt! Hope chemo is over with soon and it does it's job. I love the green and yellow quilt. I love the cat in the fabric..so true. A very nice few posts despite the nasty chemo...guess gotta hold on to that roller coaster ride of life and keep sewing. I'm going back through older posts (I'm SO BEHIND reading), and I stopped short when I saw your yellow-green quilt. I've been saving Regency Dandy fabrics for so long, not sure how to use them. And here they are, bright, bold, and beautiful in these yummy blocks. Absolutely love it! Put them with chrome yellow and poison green and make a quilt bold, bold, bold. Of course! DUH! Thanks for this wonderful inspiration. I'll be checking out Kathie's and Lorre's posts too. We can't have too many ideas. Smart cat! I would love to nestle right down in my quilt fabric for a nap. Your version of Kathie's quilt is wonderful. Now you have me rushing to my stash.